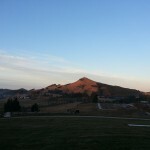 Well I’ve made it to Italy at last – leaving behind the frosty Dunedin winter for the sweltering Piedmont summer! My home base for the next few weeks is Biella, a little town of 45,000 souls tucked away at the foot of the Alps and only two hours drive from the French border. It’s not at all a touristy location – in fact one of my Google results upon searching for more information called it a “drab industrial town”. Ouch. But this wide-eyed Kiwi wanderer is not to be discouraged, so I’m braving the heat to find out exactly what this town has to offer. I started off in the fairly modern south of town, walking between rows of high apartment blocks which are the standard form of housing in Italy. Detached houses like you might find in New Zealand are pretty rare here. Heading north while hugging the shadows in the 33 degree heat and consistently looking the wrong way for incoming traffic at every road crossing, I eventually made it to an older part of town. Here the streets were narrower and more likely to be formed of brick or cobble than asphalt. What I was looking for was the baptistry, built in the 11th century and if not the oldest building in town, certainly the most famous. It’s tucked in next to the cathedral, so I had to locate the Piazza Duomo, or cathedral square. This was a wide cobbled space with buildings fronting on to it from every side. One was clearly a popular hangout, with the sound of clinking glasses and chatter carrying across to this lonely tourist standing in the middle of the square. Before heading down the alley next to the cathedral, I also tried to identify the Bell Tower of Santo Stefano, the only remnant of the 4th or 5th century church of Santo Stefano which was demolished in 1872. Since towers have a habit of being quite obvious, this wasn’t particularly difficult. Then it was time to approach Biella’s pride and joy, a surprisingly small circular brick building hidden down a side street. Biella does indeed have a long industrial history, having been a centre for wool and textiles for at least four hundred years, helped by the many alpine streams and rivers in the district which powered the mills before electricity. There was a massive boom in the 1800s although since the Second World War there’s been a decline due to cheaper manufacturing overseas and many factories have closed. Still, if you’re into fine cashmere garments, you should be able to find a bargain at one of the outlet stores in town. I did manage to find one, but with half price suits still fetching several hundred euros, I decided to pass. 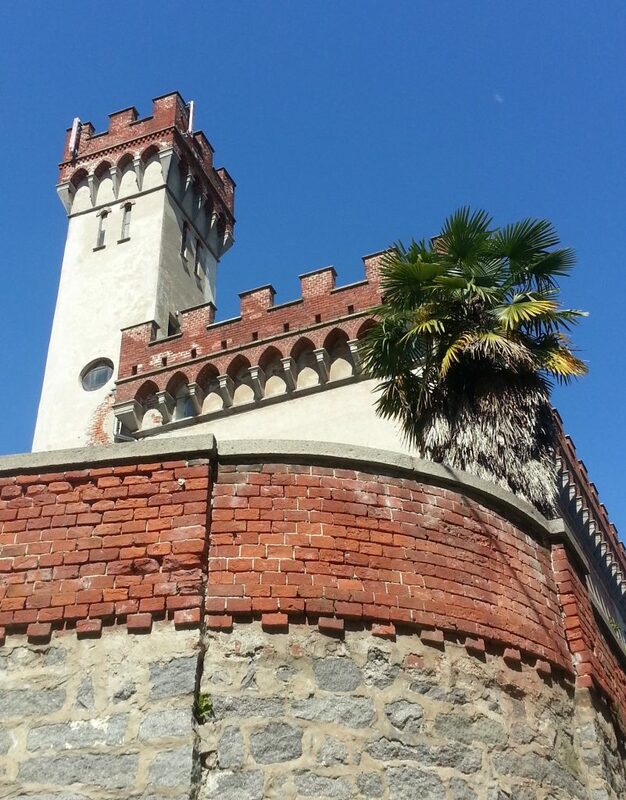 Having explored Biella Piano (Biella on the flat) it remained to explore Biella Piazzo (Biella on the hill). But before that, a gelato break was in order. 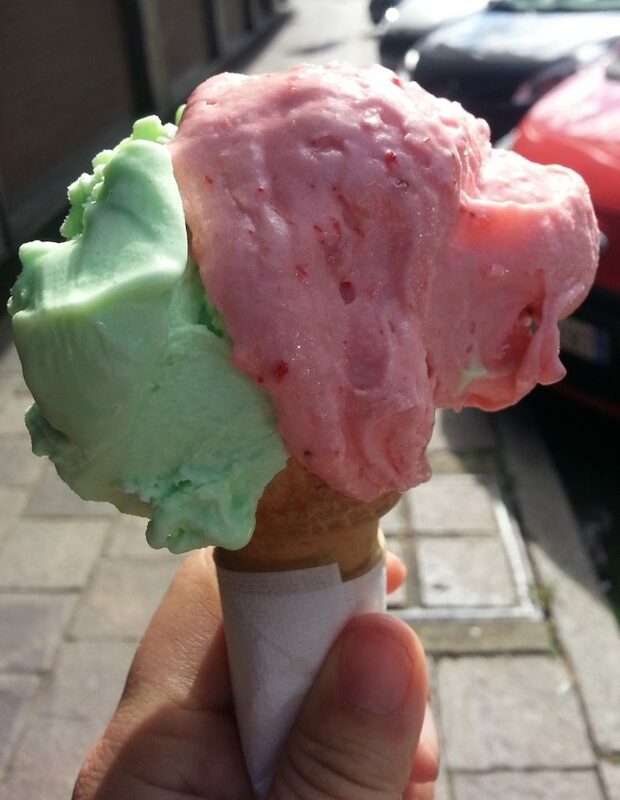 So it was off to the gelateria for a scoop of fragola (strawberry) and a scoop of menta (mint). Gelato in hand, I was ready to find my way up to the ridge to the west of town. 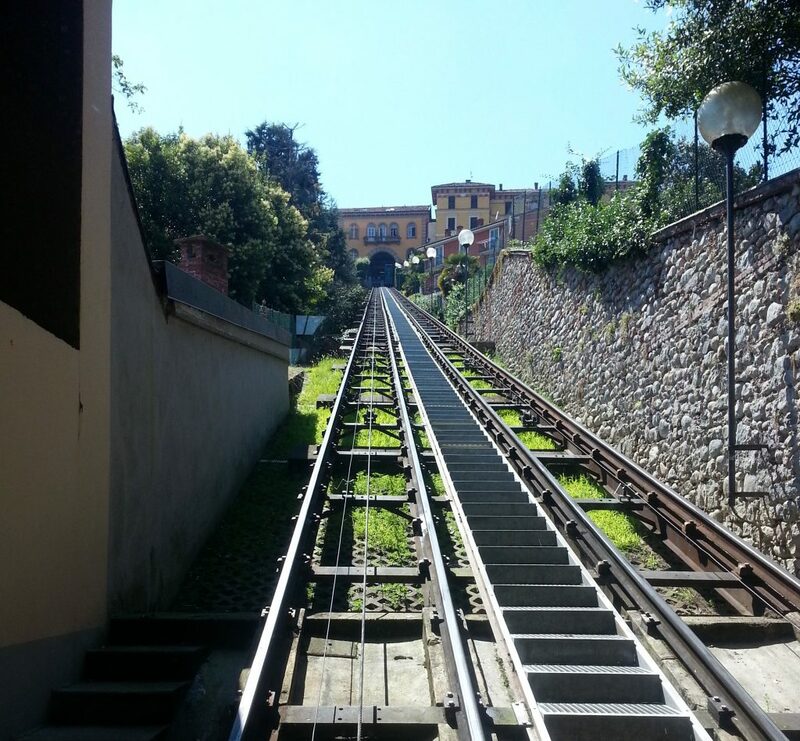 I’d already spotted the funicular railway track from afar, so all I had to do was find my way to the station. I reached the lower end of the line just as the car descended and hopped inside. I sat for a few minutes, feeling a bit silly since I wasn’t sure if there was anything I was supposed to do to get it going, but soon the car began to rise up the track as the counterbalancing car began to descend. The little carriage rattled and clanked its way slowly upward, rising above the terracotta rooftops of Biella Piano, before lurching to a halt at the top. After paying a reasonable €1.20 for a 60 minute return trip, and getting stuck in the turnstile because I didn’t realise I had to insert it to get out, I emerged into the very medieval neighbourhood of Biella Piazzo. First, as I’d been advised, I turned right to find a bridge from which I could get a good view out over Biella Piano. 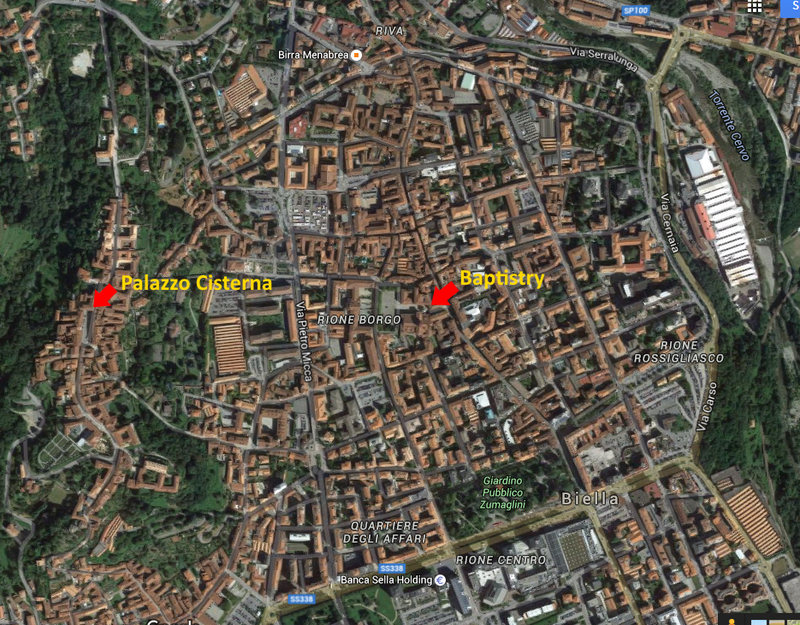 Then it was back the other way to find Piazza della Cisterna, the main square of Biella Piazzo. 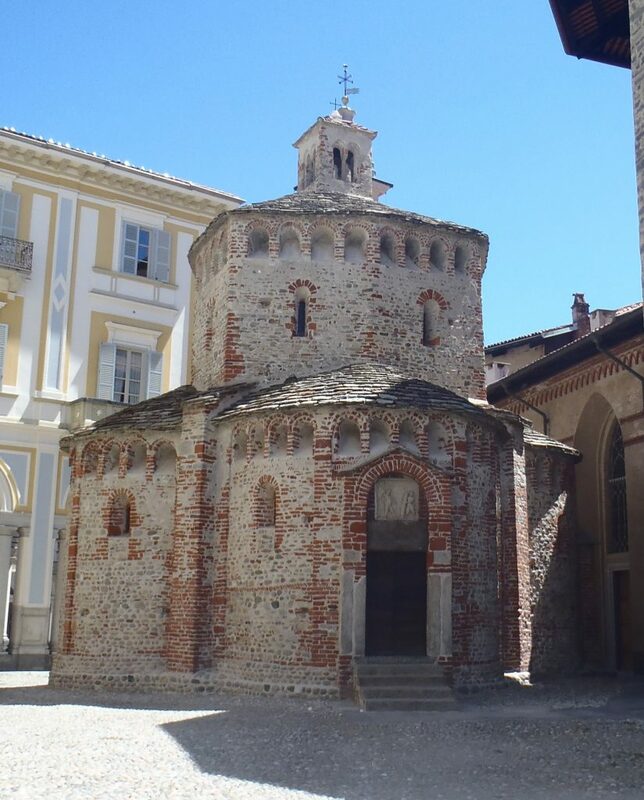 This part of town was founded in 1160 with special trading privileges granted to those who agreed to occupy the hill, in a political move to prevent the removal of the Biellese territories from the rulership of nearby Vercelli. Consequently it is a maze of narrow streets that allow you to feel as if you’ve been transported back to the middle ages. Am I really in 2016? 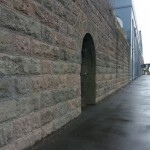 My journey took me through a tunnel of arches before I reached the square. It was quiet now in the middle of the roasting hot afternoon, but I’m given to understand that things liven up at the many bars and restaurants under the arches as day turns to evening. 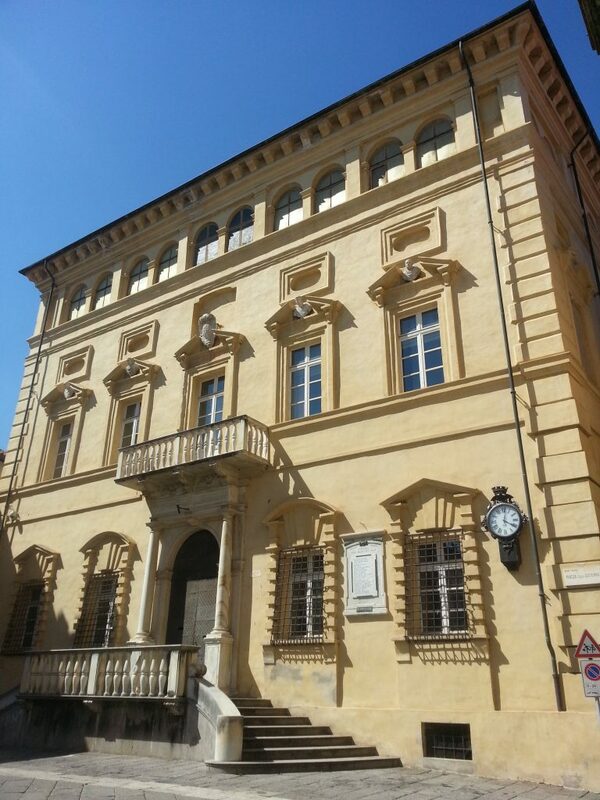 At one end of this open space is Palazzo Cisterna, or Cisterna Palace, the most famous building of upper Biella. 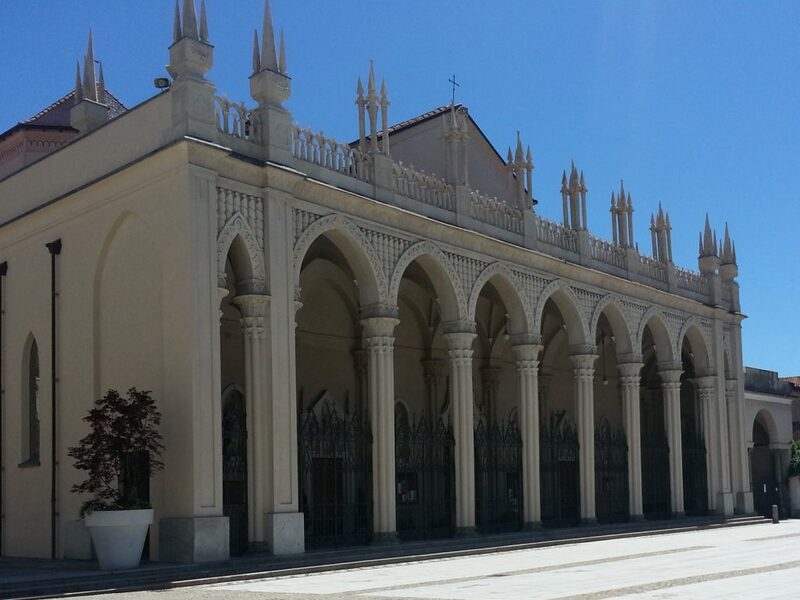 The palace is of medieval origin, although the façade is practically new, having been added in the 16th century. There’s a memorial on the front to the sons of Biella Piazzo who fell during the First World War, in which Italy fought on the side of the Allies. I continued to poke around the streets for a while, admiring the fancy buildings that abounded. Eventually I began to suffer under the relentless sun, so I had to beat my retreat back down the hill and back to the shelter of my temporary home. As I guzzled cold water I reflected that “drab” is perhaps a matter of perspective – this introduction to Italy was interesting enough for me, and I’m sure it’ll make an excellent home base as I continue my adventures in the region. This is great Amanda. Gives a great feel to where you are. 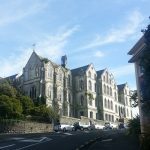 This sort of age and architecture is so unlike anything we have in New Zealand. Keep up the adventuring. Hi, loved reading your posts about Biella. 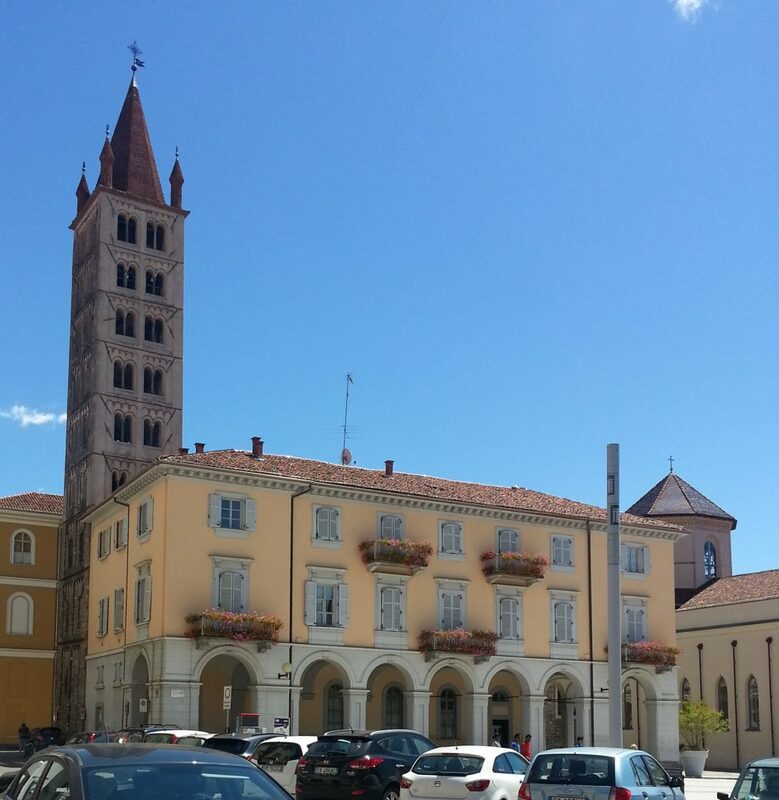 I was wondering if you could help me my giving me a no holds barred review of living in the town of Biella seeing as you stayed there a few weeks and so would have seen it from a local’s point of view rather than just someone just visiting for a day. 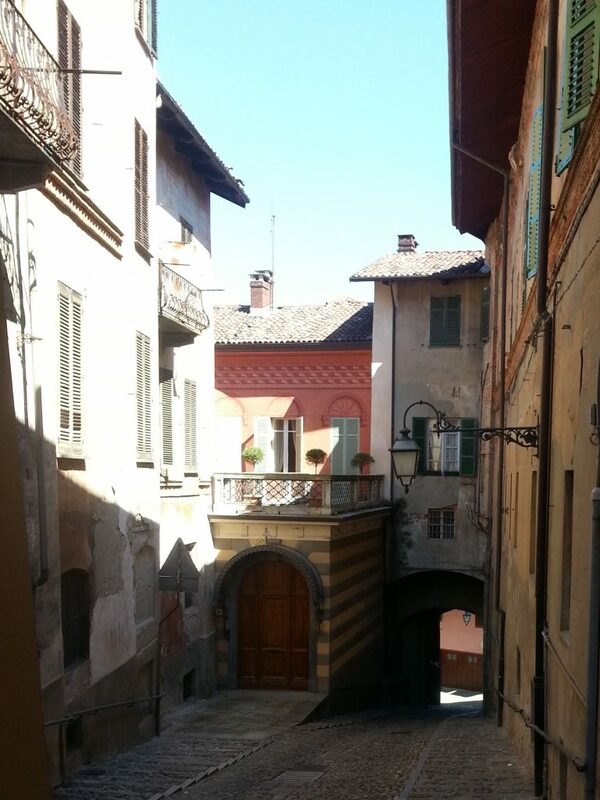 The reason I ask is that I am looking to buy a small property in Italy (have been looking for ages) and recently came upon an apartment in Corsa del Piazzo which is one of the streets that lead up the hill to the historical town. 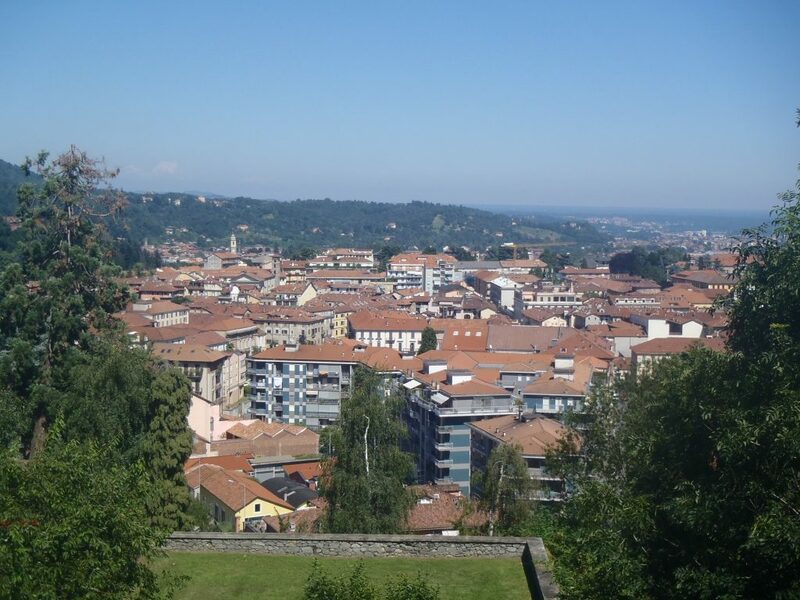 I have never been to Biella, although am planning to visit in April but would really appreciate your views on the town. It seems a little run down and neglected. Is that the case? Is there any sort of culture or restaurant life happening there? All the photos I look at the place seems deserted. I don’t mind quiet but don’t want depressed if you get my drift. Slightly buzzing would be good, just people going about their business and life. A living place as opposed to sad. Anyway, thanks for your help and opinions. 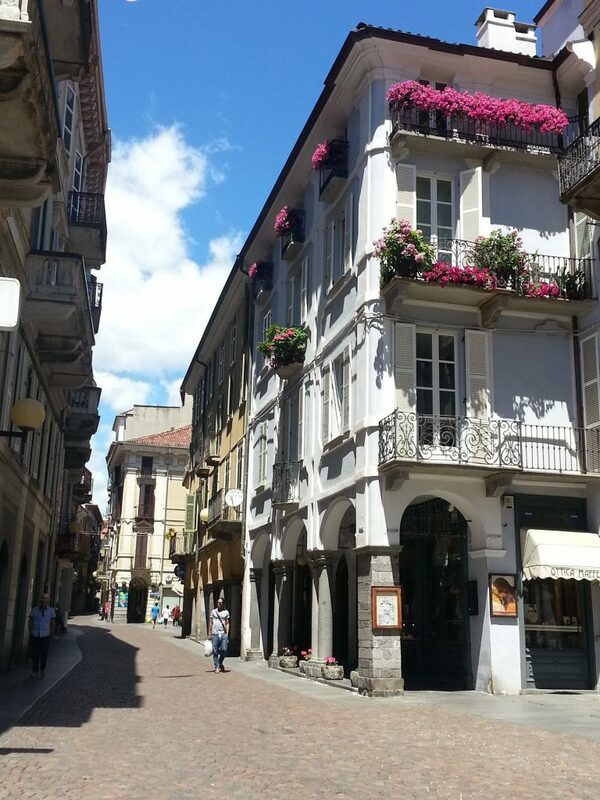 Hi Kerrie, I loved Biella, but that might have been because it was the first Italian town I ever visited. There is a fairly lively evening dining and bar scene around the centre of both the upper and lower town. Another advantage was that it didn’t have so many beggars and panhandlers as larger or more popular towns. 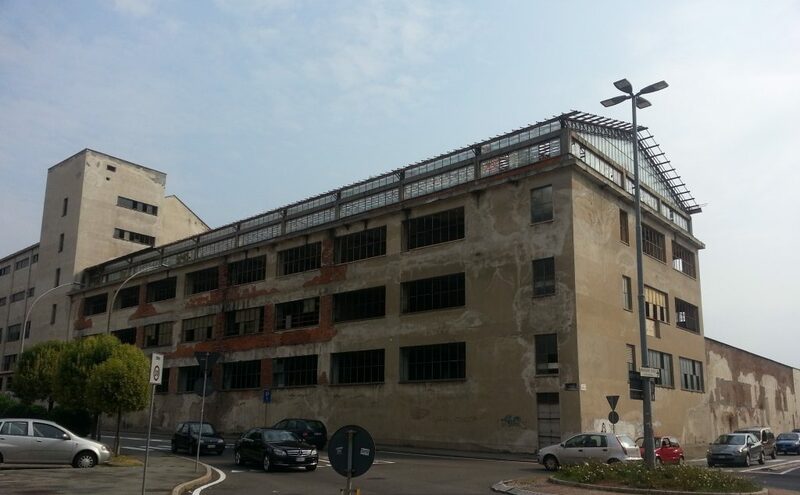 There are quite a few abandoned buildings and factories though, and in comparison to other Italian towns it doesn’t have a lot to offer in the way of attractions besides the alps. I wish you luck with whatever you choose!